← Curiosity update: We came, we science’d, we… still have a lot to do! The Mars Exploration Rover Opportunity has been exploring the surface of the red planet since 2004 and has returned a huge amount of images and information. Part of this information is a data set of several hundred rock and soil chemical compositions. This paper presents a method to quantify how similar each of these compositions is to each other, and to the composition of meteorites that we know came from Mars. These mathematical similarities are checked by using what is known about the rocks from images taken by the rover and ongoing geologic analysis. These comparisons have led to new interpretations about the relationships between various rocks and rock groupings along the rim of Endeavour crater, a 22-km-diameter crater explored by Opportunity. 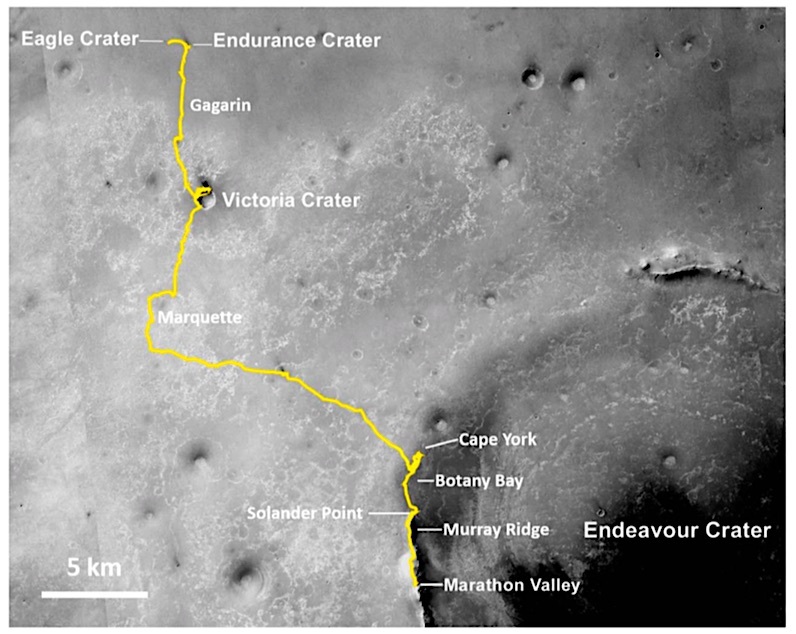 This entry was posted in Reports and tagged Botany Bay, Burns Formation, Cape York, Eagle Crater, Endeavour Crater, Endurance Crater, Gagarin, Grasberg Formation, Marathon Valley, Marquette, Mars Exploration Rover, Matijevic Formation, MER, Meridiani Planum, Murray Ridge, NASA, Opportunity, Shoemaker Formation, Solander Point, Victoria Crater. Bookmark the permalink.